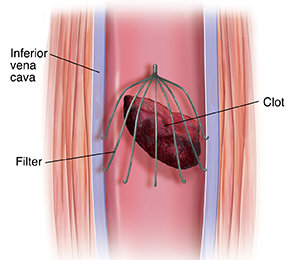 The Interior Vena Cava is a vascular filter placed into the inferior vena cafa to prevent pulmonary emboli. It looks like a little fishing lure placed through the blood vessels into the heart to act as a filter to catch little blood clots before they reach the heart or lungs. Anytime a foreign object is placed into the body, there are inherent and immediate risks. Whether those risks lie in the placement, maintenance, or life of the device, the human body does not always respond to drugs and devices as intended by their manufacturers. This filter is placed through a small groin or neck incision and threaded through a small catheter which is guided to the vessel to host it and left. The filter expands to attach itself to the walls of the vessel. In most cases it then stays in the body for as long as it remains.